Recent advances in technology have greatly expanded and simplified the ways in which people can work and make money. Craftspeople and artisans can use sites like Etsy to sell their wares; homeowners can use home-sharing platforms to earn money renting their properties to others on a short-term basis; workers are able to make money from their time, expertise or energy using a variety of on-demand services and digital task marketplaces. Together, these various services operate at the intersection of two major social trends. The first is the emergence of online platforms that facilitate direct transactions between consumers and providers. The second is the growing prevalence of temporary, part time and contingent employment. Put simply, these services allow people to work or otherwise make money at the time of their choosing, using whatever resources they have available, and with the digital services themselves handling issues such as customer matching and payment resolution. Despite outward similarities in how these services look and operate, they encompass a wide range of behaviors and characteristics. A young professional who occasionally supplements her income by renting out her apartment on Airbnb is much different from a single mother who works for a ride-hailing service in between child care obligations. And each of these examples is in turn vastly different from sites like Upwork that connect businesses with highly specialized freelance workers. A 2015 survey by Lawrence Katz and Alan Krueger found that nearly 16% of all workers are engaged in “alternate work arrangements” of one kind or another (such as temporary, contract or freelance work) and that those who provide services through “online intermediaries” (such as Uber or TaskRabbit) account for 0.5% of the total workforce. More recently, a 2016 study by the McKinsey Global Institute estimated that 20%-30% of the working age population in the U.S. and Europe engage in in some type of independent work and that 15% of these independent workers have utilized digital platforms to find jobs. A 2016 study by the Freelancers Union and Upwork estimated that 55 million Americans engage in some type of freelance work and that 54% of these workers have been paid for projects that they found and completed online. A JPMorgan Chase analysis of its checking account customers conducted in late 2015 estimated that 1% actively earn income from some type of online platform in a given month and that 4% had participated in one of these platforms over a three-year period. A survey of independent workers by the consulting firm MBO Partners found that 9% of these workers (totaling around 2.7 million people) use “on-demand platforms” to connect with job opportunities. Several federal agencies have also taken steps to define and track these emerging modes of work and economic activity. 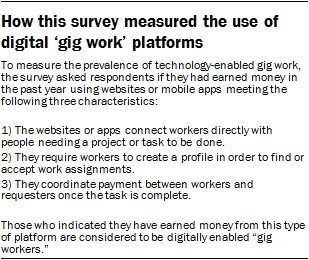 The Bureau of Labor Statistics has been tracking “contingent and alternative work arrangements” for a number of years (most recently in 2005) and will be including supplementary questions designed to capture technology-enabled “gig work” in its May 2017 survey. And a recent U.S. Department of Commerce report proposed a new definition for what it refers to as “digital matching services.” These services are defined as those that 1) facilitate peer-to-peer transactions using online platforms or mobile apps; 2) utilize user-based rating systems; 3) offer workers flexibility in determining their hours; and 4) place responsibility on workers to provide whatever tools or assets are necessary to accomplish their work. In addition to this type of gig work, the survey measured two other ways of earning money via digital platforms: home sharing and online selling. These services allow people to profit from their goods or capital (a home, a physical creation, a used item) rather than their time or labor. In some respects, the activities and behaviors discussed in this report are defined more broadly than other research that has been conducted on this topic. For example, online gig work and home-sharing each fall under the Commerce Department’s definition of digital matching firms, but online selling does not. Moreover, the survey was designed to establish broad estimates for the share of Americans who have engaged in each of these money-earning behaviors in the recent past – regardless of the intensity or regularity with which they do so. In other ways, this study takes a more narrow view. For instance, technology-enabled gig work as defined in this report is but one small component of the broader world of contingent or contract labor as studied by researchers like Katz and Krueger, and it is beyond the scope of this particular study to document that broader universe.